The company has launched Android-based smart TV models in the past as well, however, this is the first Android TV from the company. Currently, Vu offers a wide range of TVs in India in various series including Play, PopSmart, Premium Smart, Iconium, Pixelight and Quantum Pixellight. The Vu TVs are available at a starting price of Rs 9,999. Now, the company has said that it will launch the first Android TV running Android 7.0 Nougat in India. Even though the TV currently runs Android Nougat, it will be upgradable to future Android versions as well. Since it is based on Android, it has built-in Chromecast support. As of now, no other information about the upcoming TV is available. The latest move from company appears to be aimed at Xiaomi’s recent entry into the Indian television market with cost-effective smart TVs. Xiaomi has launched a 55-inch 4K HDR Mi TV 4 priced at Rs. 39,999 last month. The company has even introduced its cheaper, smaller Mi TV 4A range of televisions just this week. The Mi TV 4A 32-inch is priced at just Rs. 13,999 and the 43-inch model is priced at Rs. 22,999. Vu is hoping to take on Xiaomi with its first Android TV. More details about the Vu TV including the panel size, connectivity options and the price of the TV will be known when it launches next Tuesday. 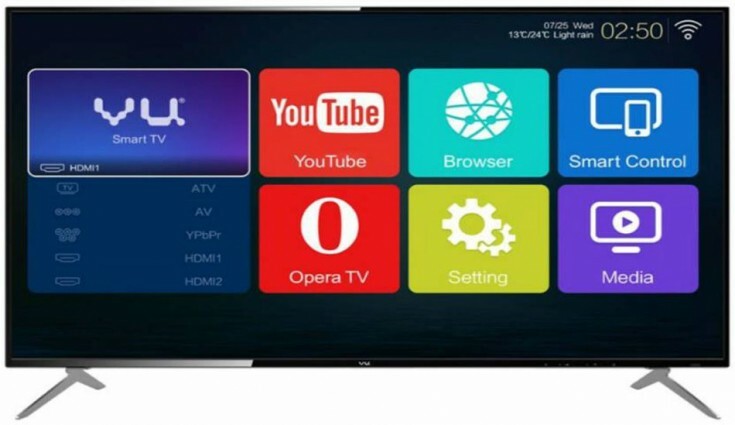 It will be interesting to see how this will compete against Xiaomi’s smart TVs.